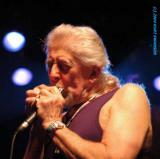 John Mayall was born 29th of November 1933 in Macclesfield, a small English village near the industrial hub of Manchester--a far cry at that time from the black American blues culture we are familiar with today. The eldest of three from humble working class origins, and in the shadow of WWII, this skinny English lad grew up listening to his guitarist fatherâs extensive jazz record collection and felt drawn to the blues. Strongly influenced by such greats as Leadbelly, Albert Ammons, Pinetop Smith, and Eddie Lang, from the age of 13 he taught himself to play and develop his own style with the aid of a neighbor's piano, borrowed guitars, and secondhand harmonicas. 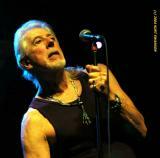 Been a fan Of John Mayall since I was in high school in the 60's. I remember seeing him at the Fillmore East back in the day. I'm going to dig out my dusty old 33's now after being inspired by this. John's a great Blueser. Nice photos.